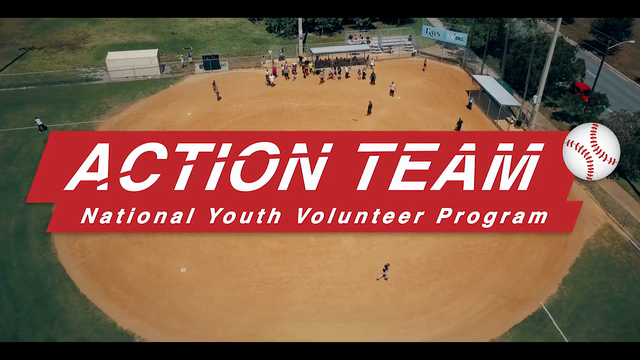 The Action Team national youth volunteer program, created and administered by the Major League Baseball Players Trust and Volunteers of America to help train and inspire the next generation of volunteers, debuted its latest TV PSA on FOX during the broadcast of the 88th annual Major League Baseball All-Star Game. The PSA, titled, Difference Makers, includes Major Leaguers Tim Beckham, Kevin Kiermaier, Lonnie Chisenhall and high school Action Team Captains, Rachel Duke of Cleveland and Hishaam Shafiq of Tampa. The :30 PSA was created using footage taken from longer video feaures that spotlight the inspiring community service work of the two Team Captains. Directed by Andrew Vallentine, the feature videos help shine a spotlight on the volunteer efforts of the hundreds of Action Team Captains across the United States by following two of them to capture a 'day in the life' of an Action Team Captain. As Rachel and Hishaam demonstrate, Action Team Captains are making a difference in their communities throughout the year as members of the national youth volunteer program. Major League Baseball Players are actively involved in the program and participate in local and regional service projects with the teens, join teens on conference calls, provide scholarship opportunities through the Players Trust and provide the Captains with signed certificates of apprecaition. The Rachel and Hishaam feature videos will be distributed at a later date. Since the Action Team program launched in 2003, more than 91,000 high school students have volunteered to help more than 280,000 people in need. Action Team enrollment is ongoing, and applications are accepted throughout the year and can be found here. You can read more about the making of the videos here. Additional inquires can be e-mailed to ActionTeam@mlbpa.org.